On Sunday, the high temperature at Bush Intercontinental Airport reached 91 degrees. This came to within one degree of the all-time record for Oct. 14, set in 2015. We can consider this the last hurrah of summer for 2018, as fall will more fully assert control this week, and seems unlikely to relinquish its grip completely in the weeks ahead. I can confidently predict that we will see no more 90-degree temperatures this year given the overall cooler outlook for the next two weeks. (The latest 90-degree day on record in Houston came on Oct. 29, 1991). Today, our weather will make a dramatic shift from summer into serious fall-like conditions. By 7am a cold front had already pushed through northern areas such as Huntsville and Conroe, and should move off the coast by around noon today. What will follow can probably be best described as Seattle-like conditions, as temperatures fall from the mid-70s this morning across the region into the 60s this afternoon, and 50s tonight. This will not be a classic blue-norther front, as the cold air mass is rather shallow, and this will allow plenty of clouds to form a few thousand feet up in the atmosphere, and this essentially means that we’ll have on-and-off rain showers later Monday, Monday night, and Tuesday. Houston’s last high temperature of 60 degrees, or below, came back on April 8 when a strong cold front hit the region. 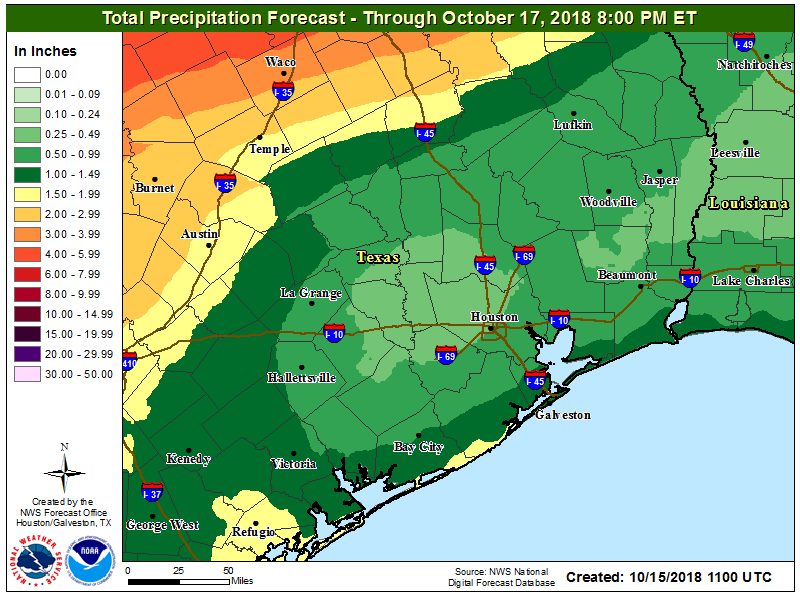 A portion of the region may not reach 60 on Tuesday, as clouds blanket the region with intermittent rainfall. We may see some brief, localized heavy showers but for the most part rain amounts will be completely manageable. Conditions will be dreary out. Fireplaces may be needed inside. Dare I say it will feel almost winter-like out there? Another dreary day. 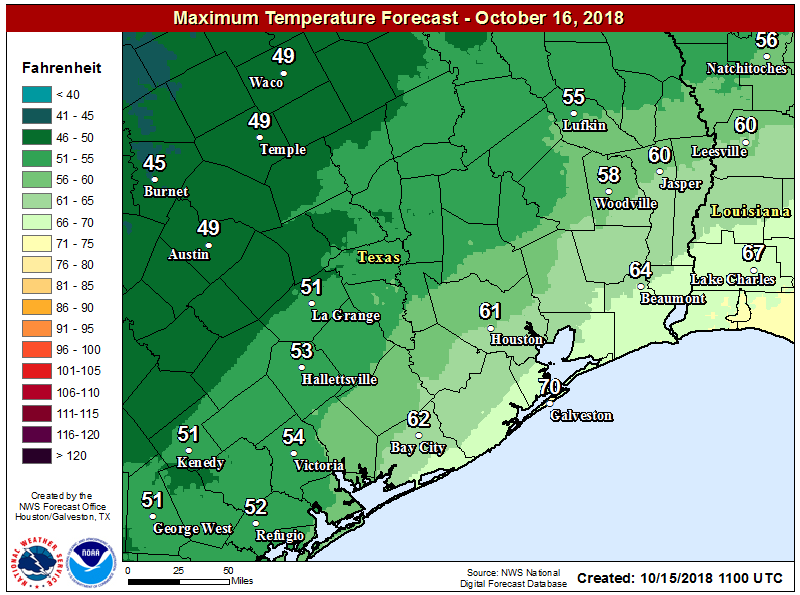 Temperatures on Wednesday morning will drop into the low 50s for most of the region, and then only warm into the low 60s for Houston. Rain chances will be somewhat reduced, but clouds will still be omnipresent. We’ll start to see a warming trend, as highs creep back up to around 70 degrees. We should still expect cloudy skies and scattered showers. Moisture levels surge toward the end of the week, and it seems like we’ll see widespread showers on Friday, along with high temperatures in the mid-70s. We’ve already had a lot of questions about this weekend, and I’m afraid there’s not great news for outdoor activities. While the forecast is still in flux, we have a couple of considerations. That surge of moisture may be ebbing by Saturday, but at the same time another cold front will be advancing through Texas. Add it all up, and I think we’ll see maybe a 50 percent chance of showers and thunderstorms on Saturday, with highs somewhere in the range of the mid-70s, with fairly high humidity. Sunday will depend upon the timing of the aforementioned front, in terms of both rain chances and temperatures. We do, at this time, expect lower rain chances Sunday, and drier air if the front moves through. Skies still look cloudy, however, and we may not see the Sun for a prolonged period of time until next Tuesday or Wednesday. Seattle, indeed. Good riddance, summer. Bring on the cool weather. Thanks Eric, for your outstanding reports. Looking forward to a great Fall. I will do my final no-shirt run of the summer tonight as a welcome to our fully deserved weather. Thanks Eric. Can we please get a Bike Around the Bay forecast on Thursday or Friday? You mentioned the latest 90 degree day occurring in 1991. I seem to remember a cold Halloween that year. Did it come in that fast, or is my memory wrong? You are not wrong! Quite a memory. Halloween temperatures for 1991 in Houston show up in the top-five coldest ranks for Houston, Galveston, and College Station. My daughter was one, we had just moved back to Houston and were staying in an apartment while we looked for a house. My husband was working in Galveston. I thought I remembered not opening the door to trick or treaters because it was too cold and I had just figured out that the heater wasn’t working. Thanks for verifying that my memory is still intact…sometimes! The Wings over Houston Airshow is this weekend at Ellington. If you were to look in your crystal ball, is the best shot to be able to see the jets actually fly on Sunday? Without knowing the constraints, I really can’t say. Lots of clouds. Probably only a 20 percent chance of rain. The weather pattern this morning is very strange. While the cold air storms down from the northwest, the rain showers are moving up from the Gulf. I take it this is because the air at higher altitudes is still moving in from the Gulf? Okay, I have a serious question. I’m on the 20th floor of a tower in downtown Houston right now. My coworkers all suddenly mentioned seeing snow out the window. I didn’t believe them until I saw it too, little fluffy white things falling outside our window. Is it at all possible that this high up there are “flurries”? The weather stations downtown still say 72 degreees… Or are we just seeing something else that looks an awful lot like snow? Right now it has changed to pouring rain. Temps typically fall about 3 degrees every 1000 feet, so that might make sense for a mountain that’s 14,000 ft high. But the 20th floor of most buildings might be 500 feet at best – the tallest building in Texas, for reference, is the chase tower and that’s a little over 1,000 feet. My guess would be hail. I totally understand that but I’ve never seen fluffy hail. I’m almost more convinced that maybe it was some kind of dust or debris from the tops of one of the towers, but it really did look exactly like snow. I want to believe. I cannot imagine you were seeing snow. I couldn’t either but now I’m seeing friends in other buildings around Houston posting it too. I don’t know what to believe anymore. Those “rain flurries” drops of light drizzle float around like snow flurries. Just light drizzle. 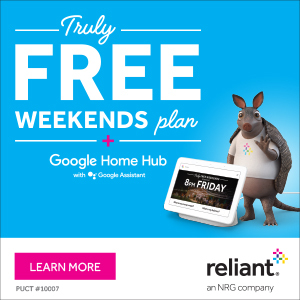 Headed to San Antonio for the weekend. Is it going to be miserable weather wise?